For the longest time, I referred to the "drizzle" on our biscuits as "swizzle." The word swizzle was fun and seemed more fitting. I still use it even though the correct definition of swizzle is an unshaken cocktail, an alcoholic cocktail made with gin or rum or the swizzle stick you use to stir a drink. Whatever term you opt to use, swizzle or drizzle, you can add it to any of our homemade dog treat recipes. It's delicious. And, addicting. 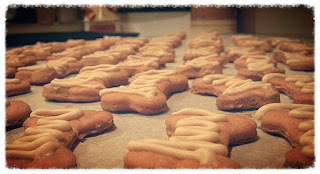 Once you've made any of our homemade dog treat recipes, or your own, allow the biscuits to cool and dry. The amount of drizzle or swizzle you'll need depends on the amount of biscuits you want to decorate. For a single batch of our Bodacious Biscuit Love Peanut Butter Dog Treats, I use 1 cup of white chips and 1 tablespoon of Skippy Natural Peanut Butter. Melt this mixture in the microwave at 15 second intervals. Stir each time. When it's all melted and mixed, let cool for a minute. Pour mixture into a plastic zip-lock sandwich bag. Once sealed, cut the tiny tip from the corner of the plastic bag. Drizzle the mixture onto the biscuit. If you're going to add sprinkles, take a break from swizzling the drizzle every 6-12 biscuits to add sprinkles of choice. 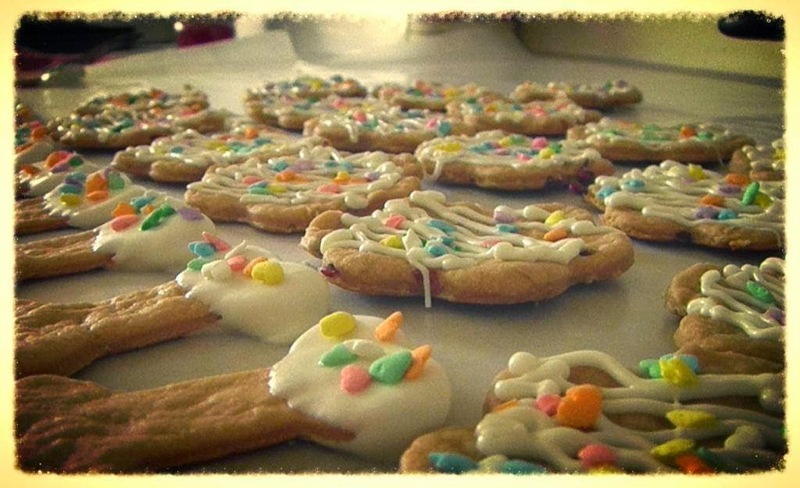 It's nothing fancy, but it tastes delicious and adds a festive flair to the biscuits. Isn't white chocolate poisonous to dogs? No...unless your pup has allergies. Always check the ingredients because those can differ from brand to brand. For the holiday treats we bake for our furry kids, I like to mix a little melted white chocolate with peanut butter to drizzle on top of the treats. Or, use that same mixture for sandwich style dog treats. We don't make those often because there's a lot of sugar in white chocolate.